Make yourself at home in one of the 61 guestrooms, featuring kitchenettes with refrigerators and microwaves. Complimentary wireless Internet access keeps you connected, and flat-screen televisions are provided for your entertainment. Make yourself at home in one of the 128 air-conditioned rooms featuring flat-screen televisions. Your pillowtop bed comes with premium bedding. Complimentary wireless Internet access is available to keep you connected. Private bathrooms with bathtubs or showers feature complimentary toiletries and hair dryers. Make yourself at home in one of the 202 air-conditioned guestrooms. Complimentary wireless Internet access is available to keep you connected. Bathrooms have showers and hair dryers. Conveniences include phones, as well as desks and blackout drapes/curtains. Make yourself at home in one of the 239 air-conditioned rooms featuring minibars. Complimentary wireless Internet access keeps you connected, and cable programming is available for your entertainment. Bathrooms have bathtubs or showers and complimentary toiletries. Conveniences include irons/ironing boards, and housekeeping is provided daily. When you stay at Solo Sokos Hotel Paviljonki in Jyvaskyla, you'll be near the beach, within a 5-minute drive of Toivolan Vanha Piha and Alvar Aalto Museum. 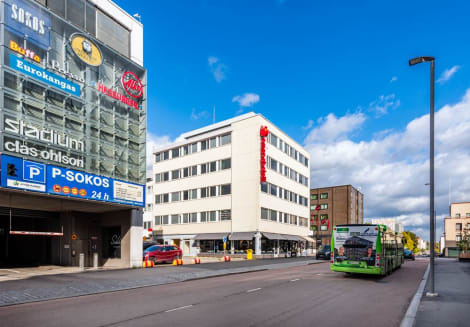 This 4-star hotel is 1.2 mi (1.9 km) from University of Jyvaskyla and 1.5 mi (2.4 km) from Jyvaeskylae Art Museum. lastminute.com has a fantastic range of hotels in Jyvaskyla, with everything from cheap hotels to luxurious five star accommodation available. We like to live up to our last minute name so remember you can book any one of our excellent Jyvaskyla hotels up until midnight and stay the same night.